Here at the LaurenConrad.com HQ, we’d be lying if we didn’t own up to our churro obsession. Whenever the sun-soaked season rolls around we consider it the perfect excuse to bust out a new sugary sweet confection. You may already be familiar with our chocolate dipped churros, cinnamon sugar churro cake, and classic homemade churro recipes just to name a few! We just can’t help ourselves. That being said, we’re sure that this next dessert recipe won’t come as a surprise at all. 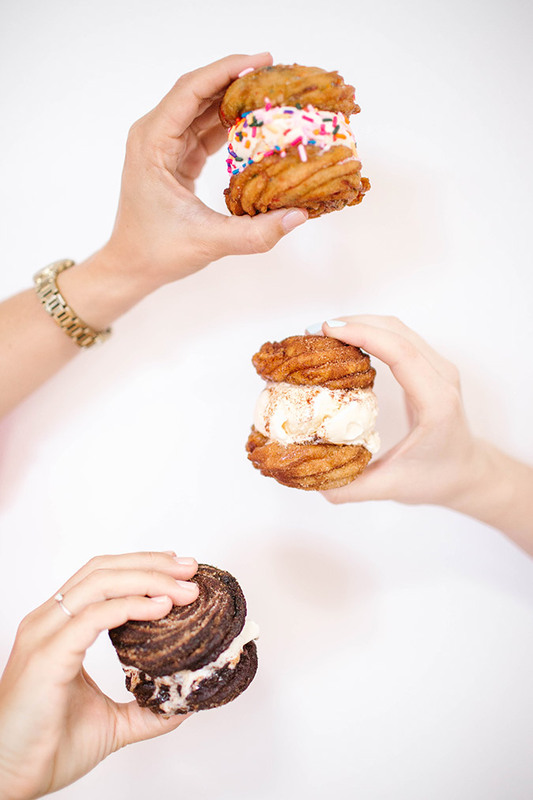 Our resident baker extraordinaire, Lauren Lowstan, dropped off a treat at our latest photo shoot that revolutionized our churro cravings…say hello to churro ice cream sandwiches! 1. Whisk the topping ingredients together in a shallow dish and set aside until ready to use. 2. Place the water, sugar, and butter in a saucepan and stir together on high heat. 3. Let the mixture come to a boil and then turn the heat down to low. 4. Immediately add in the flour and mix quickly with a wooden spoon or rubber spatula until a ball is formed. 5. Take off the heat and add the flour mixture to a bowl of a stand mixer fitted with a paddle attachment. 6. Add in one egg and beat until the egg is completely mixed in (about 20-30 seconds). 7. Scrape down your bowl and add in the other two eggs, following the same process as above. 8. Add in your vanilla and beat until it comes together. 9. Let the dough sit for 5 minutes to cool down. 10. Line a baking sheet with parchment paper and spray with cooking oil. Add a star piping tip into a plastic piping bag. Set aside until the dough is ready. 11. Add the dough to the piping bag. 12. Pipe small circles (about 3 inches) onto the parchment-lined baking sheet. Once you’ve piped all your circles, place your sheet tray into the freezer. You want the circles to be rock solid. 13. Preheat your oil in a medium saucepan and let it come to 350 degrees. (You want about 4 inches deep of oil). 14. Peel your churros off of the baking sheet (they should be able to come right off without sticking to your hand) and place a few in the saucepan. 15. Fry for 4-5 minutes on each side, until they puff up and the outsides are golden brown. 16. Take the churros out of the oil and place onto a plate lined with a paper towel. You want the excess oil to drop off just a bit. 17. Place churros into the cinnamon sugar dish and shake the dish until the entire churro is covered. 18. 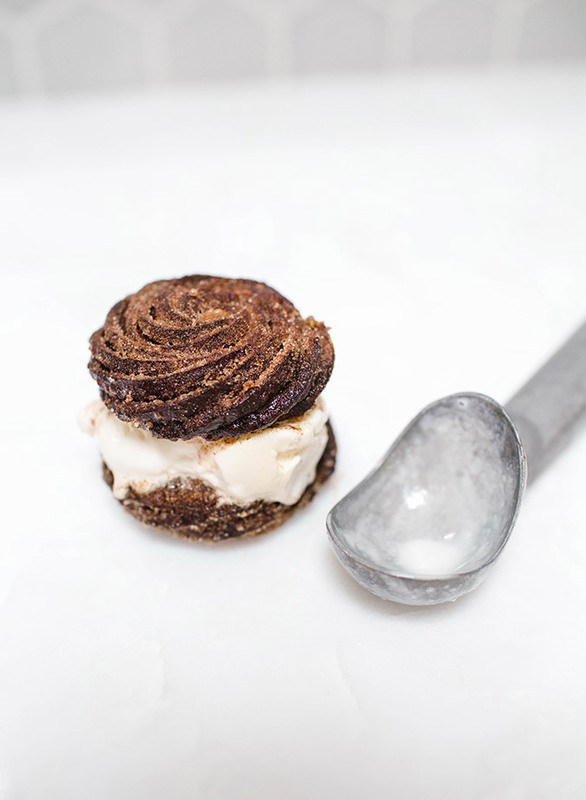 Once you’ve coated the churros in cinnamon sugar, place a scoop of vanilla ice cream between two of the circles to form an ice cream sandwich. Enjoy! 11. Add in the rainbow sprinkles to the dough and add the dough to the piping bag. 12. Repeat the rest of the steps from cinnamon sugar churro recipe. 13. 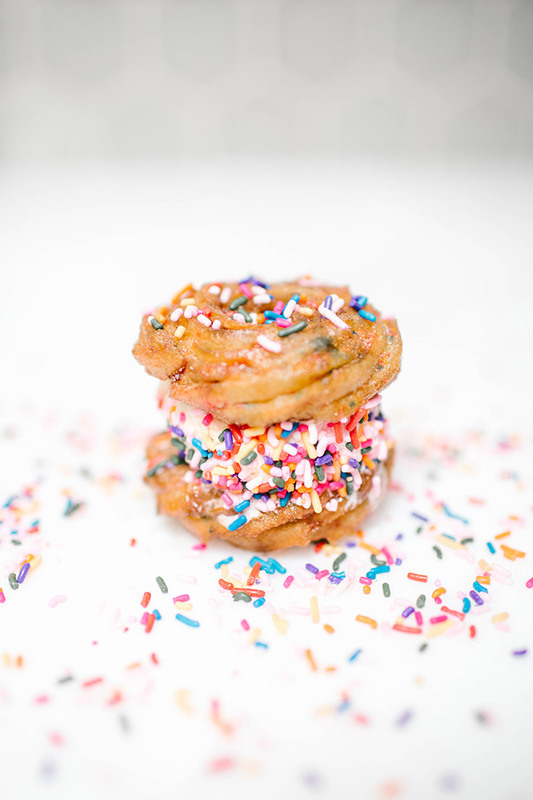 Once you’ve coated the churros in rainbow sprinkles, place a scoop of vanilla ice cream between two of the circles to form an ice cream sandwich. Enjoy! 4. Immediately add in the flour and cocoa powder and mix quickly with a wooden spoon or rubber spatula until a ball is formed. 5. 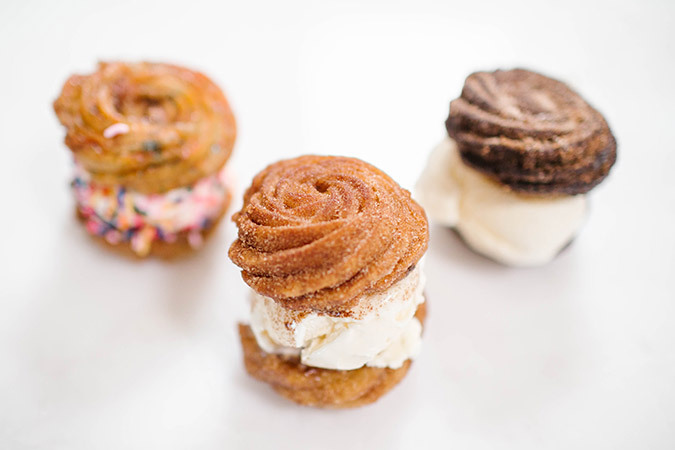 Repeat the rest of the steps from the above churro recipes. 6. 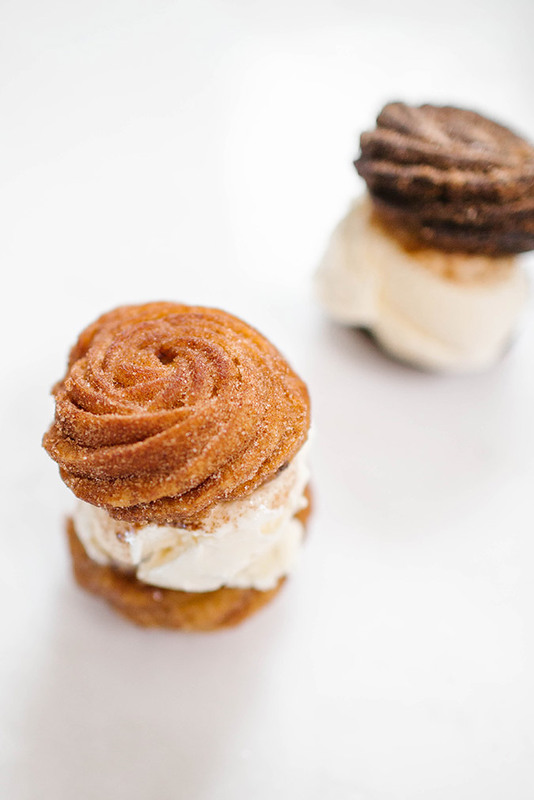 Once you’ve coated the churros in cinnamon sugar, place a scoop of vanilla ice cream between two of the circles to form an ice cream sandwich. Enjoy! And you know that we tried all three flavors! They’re all so good, we couldn’t even pick a favorite! Which one of these flavors appeals to you?